Height: 8 feet tall in salamander form, 5'9 in Lizard man form. Skin/Fur/Scales, Etc. : Streamline, orange markings and a splashes of black scales on his back, tip of tail, and a bit on his frill. 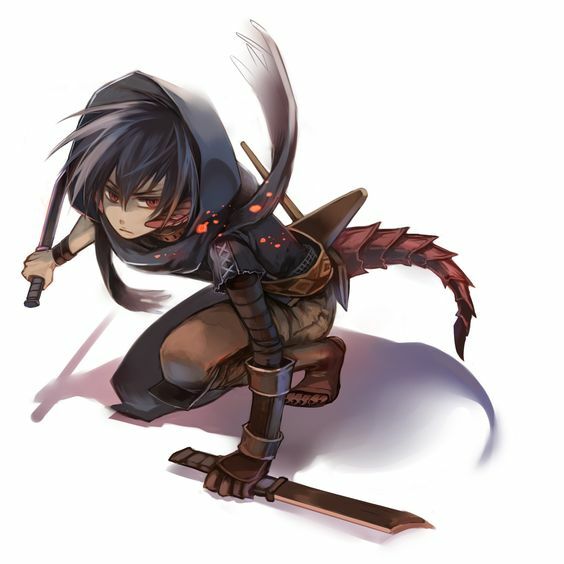 His scales would be like Kevlar in this world, being able to shrug off most physical and ranged attacks, such as arrows, for the most part at least. Lizard man form still has the same coloration of his scales, but his human skin is tan. Hair: Salamander form has no hair to speak of, though Lizard man form has jet black hair. Looks: With a raptor like build in salamander form, Haraka has a slim and streamlined build. His frill is also kind of used to either scare or intimidate people, but also uses it, along with his tail, to show emotion. Lizard man form is like any old lizard man but but this time he is still pretty fast and strong, though nowhere near as strong as, say, Jirago, or his Salamander form, but still stronger than a normal human. He usually wears tan shorts, a black short sleeve shirt, and a hood to hide his frills. Weapons: Unlike Jirago, he actually carries weapons in Lizard man form, two daggers and a crossbow, with added scope. Items: He has sheathes that he stores his daggers in as well as a language book he holds in a backpack. Hobbies/skills: Haraka, being a predator, would naturally be good at hunting. But he is also good at meditating, cooking, and assassinating. Strengths: With a body built to combine speed, power, and agility. His bones slim and hollow to cut down on superfluous weight, but honeycombed to keep them strong and durable. His head is tapered and narrow, rowed with slender teeth, edged with razor but ridged and tough for thrusting into most armor. His tail is prehensile, though does not act like a third limb like you would expect. Instead, it is used to show emotion, but can still be used for combat, using quick lashes. He also has a slashing, almost Raptor esque killing claw on his feet. He is also a tough nut to crack. -Heavy weaponry can break him easily. -Scales, though strong, can only carry him so far into combat. -Slow and sluggish in mornings, has to warm up before doing anything major. -Ice attacks will do a lot of damage due to cold blooded nature. -Lizard man form isn't as fast, agile, or as strong as Salamander form. -Can reach true speed if in a place filled with obstacles, like trees or boulders. -Looses venom spit attack in Lizard man form. -Looses toe claw in Lizard man form as well. Special abilities: The ability to change from Salamander to Lizard man at will, as well as super speed. Being able to go up to 60 MPH in Lizard man form, and 200 MPH in Salamander form, but this is only in large, open areas, like fields or a place similar to the Outback. He also has the ability to spit globs of venom, which can cause irritation if it gets on the skin and temporarily blindness if in the eyes. Salamander form- Biting, slashing, tail whipping, clawing, and spitting. Lizard man form- Kicking, slashing, shooting, and tail whipping. Combat style: He is always moving, trying to get in when it's go, slice/bite, then tries to get out when it's starts going to get heated up. Rinse, repeat. A hit and run tactic to be exact. Personality: He is a strong, quiet type. Using his tail to do most of the talking. He is also very handy around the house, meaning he is more than happy to help a person (mostly his teammates) with something. Like cooking, or cleaning. He is also very clever and smart, being able to get out of even the hairiest of situations... for the most parts at least. Likes: Friends, meat, reading books, tea. Dislikes: Show offs, people who disturb him when reading, people who break his tea cups, anybody who treats reptilians badly. Backstory: Haraka was one of the few Salamanders used by mages to do shape shifting experiments. He was chosen for being one of the fastest, most agile of Frilled Lizards. Frilled Lizards are known for their speed, but Haraka takes it to a new level by even going faster. After using a strange, glowing mushroom and placing it on a piece of meat, he ate it and transformed into a Lizard man. He was then placed back into his cage, but then a freak accident happened, releasing him, and a few other Shape shifting Salamanders out and into the wild, where they now roam to be free in a new place to call home. Haraka now resides in Dragon Storm.